The Footsie Index rose at the back of lifted oil prices in yesterday’s session ahead of the Fed’s rate hike and not so dovish policy statement that well erased its earlier gains. Nonetheless the index managed to close higher by 0.96% supported by lower inflation reports as a result of the overall decline in oil price. On the data front we have BOE’s anticipated unchanged interest rate decision and UK retail sales report that should impact the Index with its effect on the country’s economic activity. 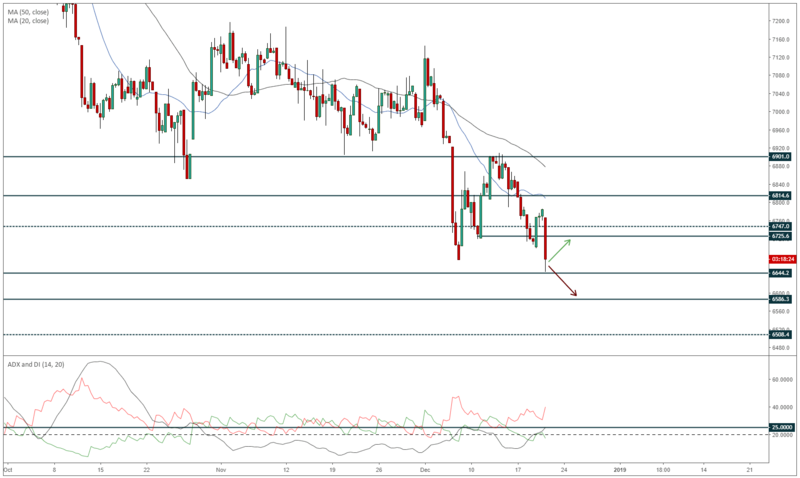 Following yesterday’s sharp decline, the Footsie index could see a rebound to 6726-6750 zone of resistance as it touches the oversold threshold on the hourly time frame. Should the ADX reading move well above the 25 mark, entries on the mentioned pullback in the direction of the downtrend would be profitable as price action could move to lower support levels. Traders should draw attention to UK’s retail sales report to direct the Index's movement.